Contest: Win Precious Gems Brush Set + 2 Bonus gifts! 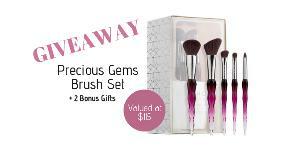 Win Precious Gems Brush Set + 2 Bonus gifts! Prize: Precious Gems Brushes ($103) from Sephora. This Giveaway comes with 2 Bonus gifts; Mini Sephora Lashcraft Mascara ($6) & Make Up Forever Mini Color Shadow ($6). Statistics: This contest was opened by 137 and entered by 22 ContestChest.com members. 16% of those who opened the contest, entered it.